In this revised edition, learn to make and install complete interiors in your car, truck or van. The author teaches you how to sew like an expert, and avoid costly mistakes. Learn to recover and build bench bucket seats, make headliners and carpets, plus how to build boat seats from scratch. Materials are described with specific recommendations for vinyl, cloth, velvet, leather, Nimbus, panel board, etc. 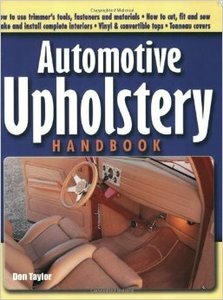 Indispensable for anyone interested in upholstery.